Conveniently located within walking distance to Culver City, the Hal Roach Studios would often use the newly constructed downtown area for location shooting. 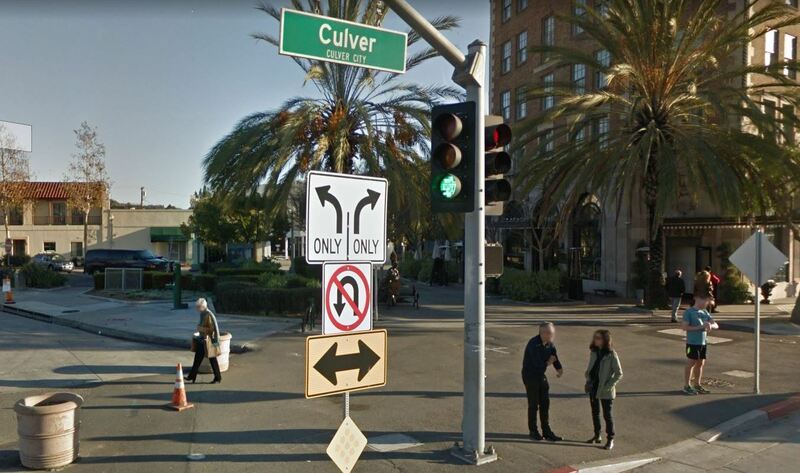 Fans of the studio’s silent comedies will easily recognize Culver’s Main Street, which runs north from Washington Boulevard towards Venice Boulevard, where portions of such films as Laurel and Hardy’s PUTTING PANTS ON PHILIP, LEAVE EM’ LAUGHING and ANGORA LOVE, among others, were shot. 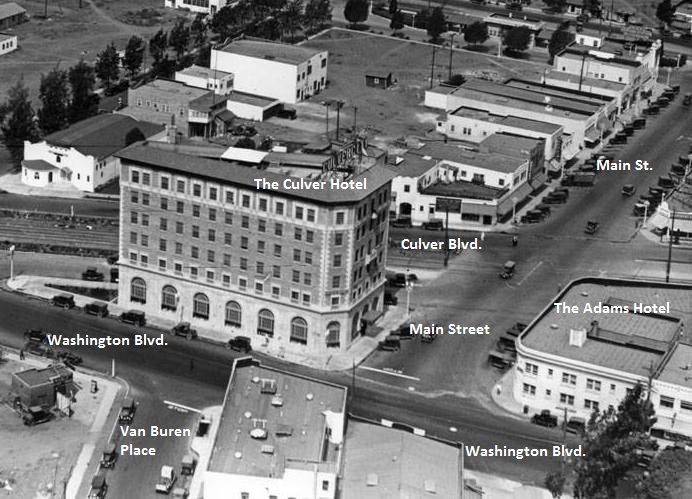 The most prominent landmark in downtown Culver City is the six story triangular Harry Culver Building which opened on September 4, 1924 on Main Street between Washington and Culver Boulevards (it can actually be seen while under construction in Our Gang’s, SUNDOWN LTD.). This “skyscraper” was designed to house Harry Culver’s (the city’s namesake and prominent citizen) headquarters on the lower two floors with the top four floors being designated The Hunt Hotel, later to be the Culver Hotel. Recognizable across Main Street from the Culver’s front door was the two story Adams Hotel, seen in several Roach films but mostly remembered today for its alleyway made famous in L&H’s LIBERTY. Downtown Culver City exemplified class and dignity, from its fine hotels and growing number of stores and businesses, to the dozens of oil wells gracing the Baldwin Hills to the south. This entire area offered a freshness and charm that the Roach studio took great advantage of in its excellent comedy shorts. By the 1970’s, though, the bloom had worn off. Many of the storefronts were now vacant or boarded. The Culver Hotel building which had been passed from owner to owner over the years was now known for its frayed carpet and musty smell. The Adams was considered to be more of a flophouse than a respectable hotel. The entire area gave the appearance of a sleazy neighborhood. Just as Hollywood filmmakers had once used the city for location shooting, TV producers now looked at it as a perfect background to depict the rundown neighborhoods required for their popular detective shows. 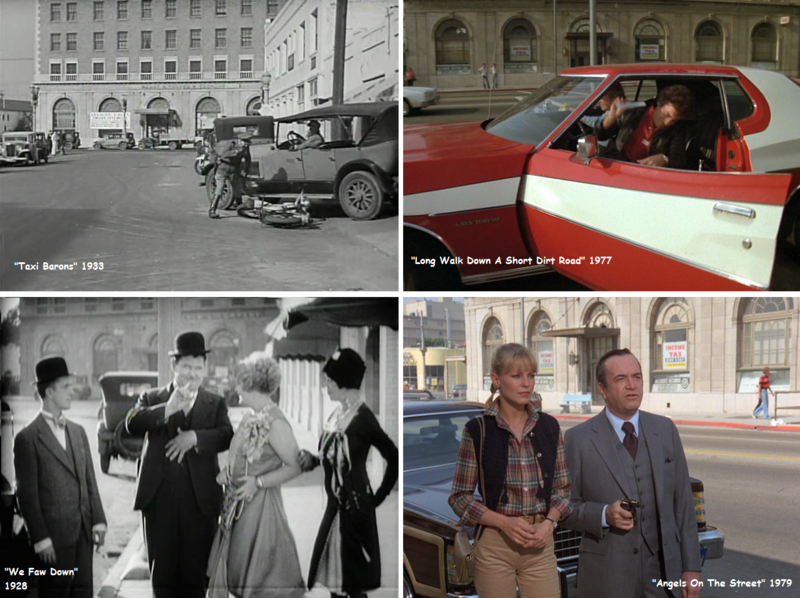 The team of Aaron Spelling and Leonard Goldberg used the downtown area for episodes of their “Charlie’s Angels” and “Starsky & Hutch” programs. Shows that depicted drugs, prostitution, and assassins were now shot on the same locations where Laurel and Hardy and Charley Chase had once made us all laugh. Downtown Culver City has seen a revival in recent years. The Culver Hotel has been beautifully restored and the once boarded or empty buildings are again alive with new shops, restaurants, and a theater. They’ve closed Washington Blvd. 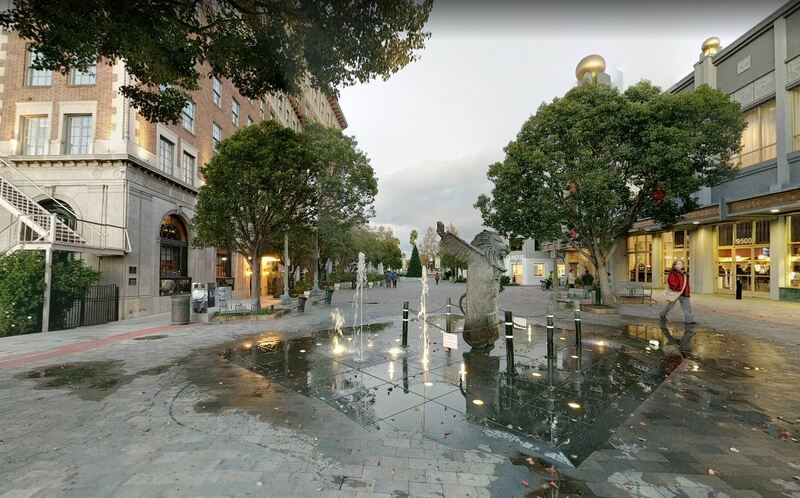 on the south side of the Culver to create a pedestrian mall with trees, benches and fountains. Fans of old Hollywood can once again experience that same charm and freshness that Hal Roach found so alluring nearly 100 years ago. Spelling-Goldberg Productions chose to shoot two episodes of their Starsky & Hutch series in the downtown area – “Snowstorm” which originally aired on 10/1/1975 and “Long Walk Down A Short Dirt Road” which aired on 3/12/1977. They also shot the 4th season Charlie’s Angels episode, “Angels On The Street”, there, which debuted 11/7/1979. Oliver Hardy passes the Loughin Building, the “Liberty” alley entrance, and the Adams Hotel as he runs down Culver Boulevard in the direction of Main Street and the Culver Hotel in DO DETECTIVES THINK (1927). 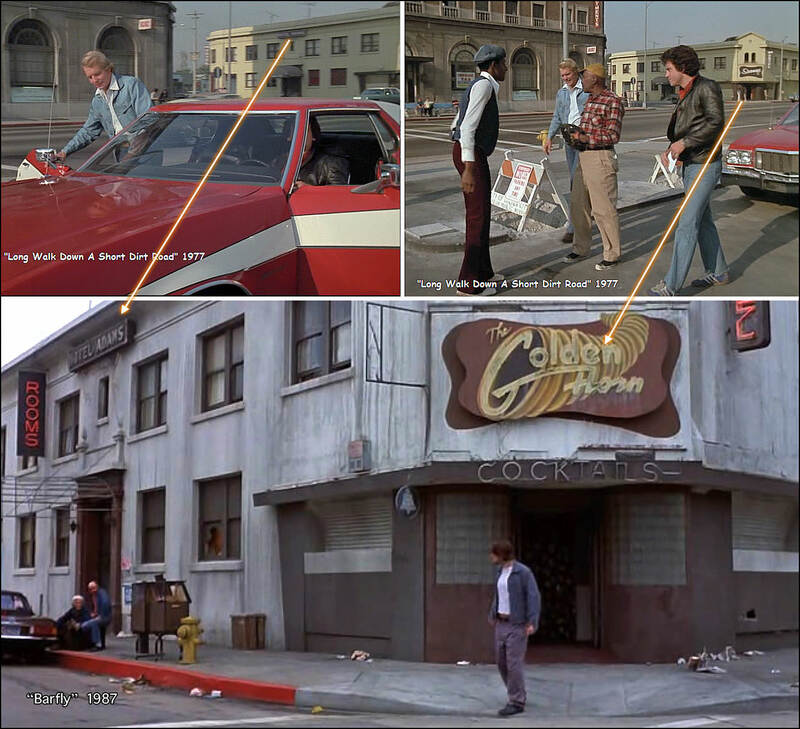 The shot on the right is the same area, looking towards the Culver Hotel, as seen in 1979 in “Angels On The Street”. Laurel and Hardy attempt to change into their correct pants in the alleyway behind the Adams Hotel in 1929’s LIBERTY. The alley was used again in 1979 for a Charlie’s Angels episode. A prostitute (actress Amy Johnson) is chased into the alley by her pimps. Fifty years later the window nearest Culver Blvd. had been converted to a doorway and the middle window had been made taller. Stan and Ollie are standing on the Culver Boulevard side of the Adams Hotel, just a little past the alleyway entrance, in WE FAW DOWN from 1928. Nearly the exact same shot was used again in 1979 for “Angels On The Street.” Main Street and the Culver Hotel are in the background of both scenes. Unfortunately this entire block of buildings, including the Adams, no longer exists and has been replaced by a parking lot. Main Street between Culver and Washington Boulevards was used many times by the Roach Studios for their location shooting. 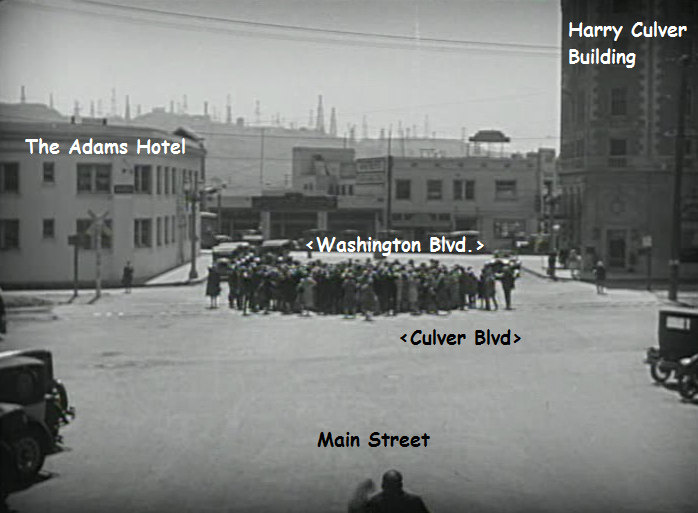 Above left, Glenn Tryon is seen in 1926’s “45 MINUTES FROM HOLLYWOOD” with the front of the Adams Hotel on the left side of the frame and the Safeway Store in the background. By 1933, the Safeway had become Master Market as seen in Charley Chase’s MIDSUMMER MUSH. 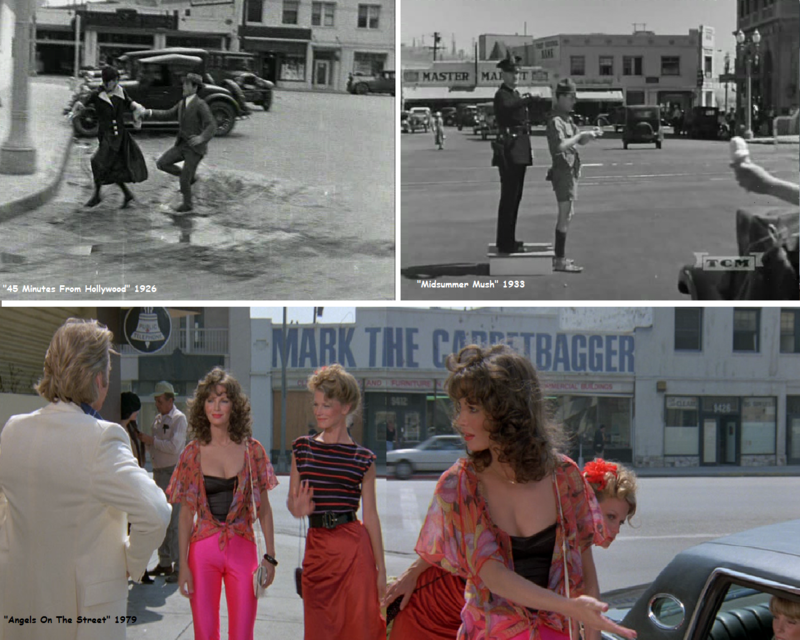 Jaclyn Smith and Shelly Hack stand on the sidewalk in front of the Adams Hotel in “Angels On The Street”. The Safeway/Master Market was by then “Mark the Carpetbagger”. Below is the same area today. Stan and Ollie stand to the left of the front door of the Culver Building in 1927 during PUTTING PANTS ON PHILIP. Nearly 50 years later, Starsky & Hutch are about to duck for cover in “Snowstorm”. By 1975 only the mounting holes for the “Harry H. Culver And Company” plaque remained. Stan and Ollie can’t stop laughing in LEAVE ‘EM LAUGHING in 1928 as they exit the Culver Building. The “Snowstorm” shot on the right shows the hotel’s new entrance and generally rundown appearance just prior to gunshots being fired. The 1932 Taxi Boys short, HOT SPOT, shows us the Washington Boulevard side of the Culver Building with Main Street and the Adams Hotel in the background. Starsky & Hutch park their Gran Torino in about the same place in 1977. We can again see the Culver and the Adams Hotels from Washington Boulevard, but from a slightly different angle, in the Taxi Boys film, WRECKETY WRECKS, in 1933. Starsky & Hutch show us the same view again forty four years later. Charley Chase’s, THE COUNT TAKES THE COUNT, gives us a nice view looking up Washington Boulevard towards Main Street with the Culver Hotel on the left and the Adams Hotel visible beyond. By the time Starsky & Hutch take a “Long Walk Down A Short Dirt Road” forty one years later, several of the buildings seen on the right in the Chase film (in front of the parked cars) were gone. But the road barricades remained. Washington Boulevard has now been converted to a beautiful pedestrian mall. Looking from Van Buren Place towards Washington Boulevard in TAXI BARONS from 1933 and WE FAW DOWN from 1928, we get another view of the south side of the Culver Hotel. Paul Michael Glaser and David Soul give us a similar view in 1977 while Cheryl Ladd and David Doyle attempt to stop a crime in “Angels On The Street” two years later. 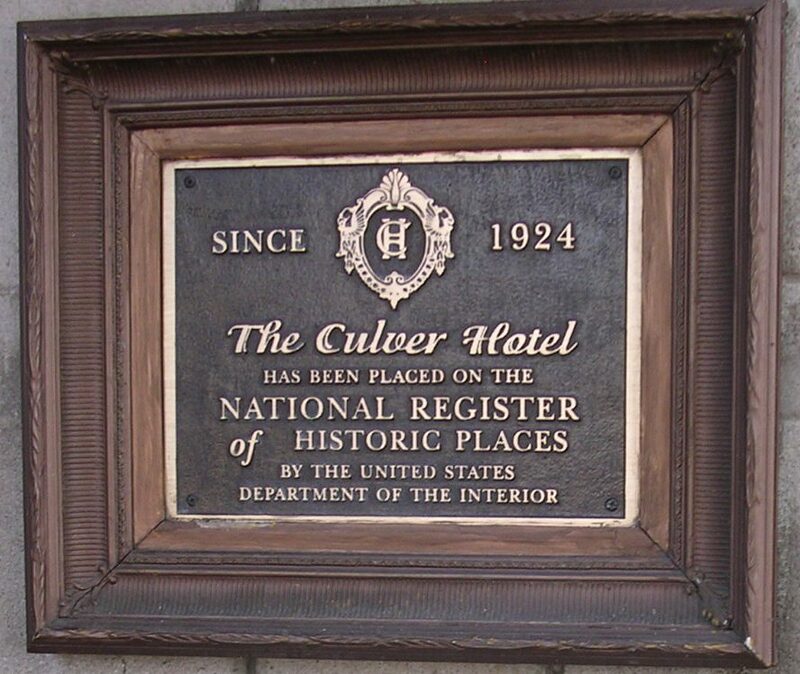 The iconic Culver Hotel is now on the register of historic places. Film and TV fans will be able to visit this beautiful building for years to come and experience what filmmakers have always loved about downtown Culver City. 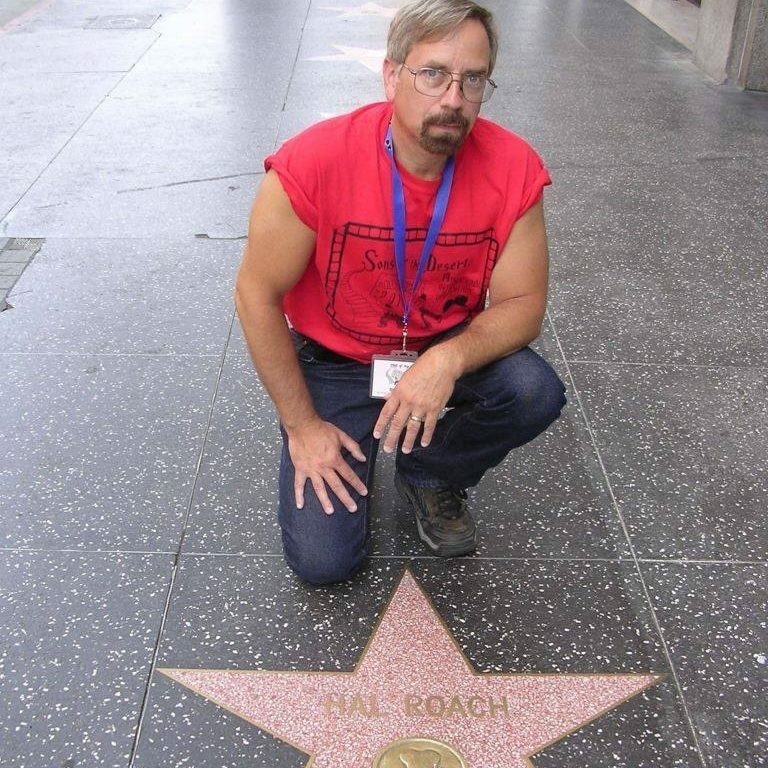 “Born and raised in the Detroit area, I’ve been a lifelong Hal Roach Studio fan. Even as a kid I was impressed by the sense of nostalgia for a time long ago that the Roach films conveyed. As a teenager I discovered that many of the old films were actually shot on location with real buildings and not on some studio mockup on a sound stage – and that some of those locations still existed. I owned many books on movie locations and am especially fond of then and now type photo comparisons. I joined the local Sons of the Desert tent (The Dancing Cuckoos) in 1976 because of my fondness for Laurel and Hardy, and currently write and edit the tent’s newsletter. Thank you Jim for sharing with us an absolutely fascinating post. The color images add an entirely new dimension. 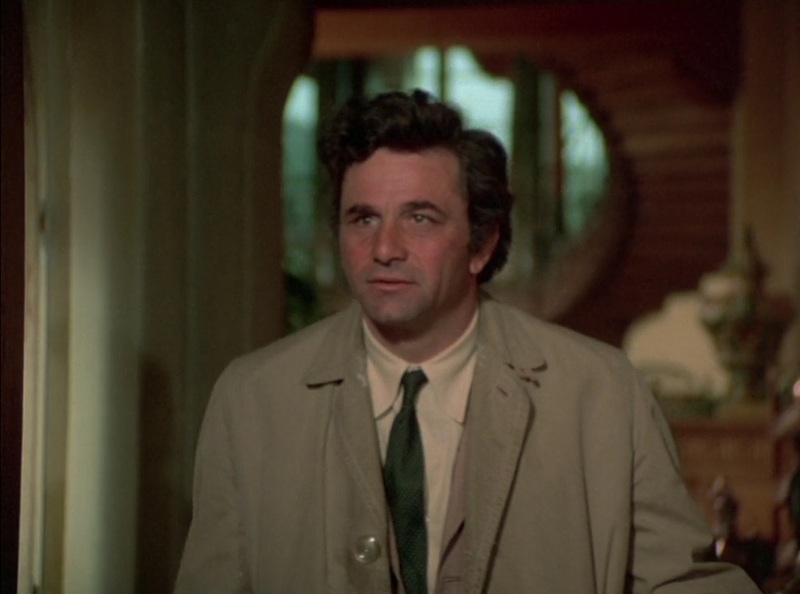 For more 1970’s TV connections to silent movies, be sure to read my post about Peter Falk as Columbo and the Silent Clowns. This entry was posted in Charley Chase, Hal Roach Studios, Laurel and Hardy and tagged Charlie's Angels, Culver City, Hal Roach Studios, Silent Comedians, Silent Comedies, Silent Movie Locations, Silent Movies, Starsky & Hutch, then and now. Bookmark the permalink. Thanks again, John, for allowing me the honor. Thanks again for your work, and to the other contributors who make it such fun! Thanks, Jim, for a fantastic guest column! I checked out your website, it is terrific as well! Hubert Diltz was my great uncle. It is my understanding that it actually was Hubert who drove the tractor in “Divot Diggers”. Hubert’s brother Charlie was my paternal grandfather, and the Sennett Bathing Beauty Charlie married was my grandmother, Elva. While looking through the photos in this post, I recognized a location from the 1987 movie, “Barfly”. I’ve only ever seen the building in Barfly, this blog post is the first time I’ve seen the building in the “real” world. But as soon as I saw it, I instantly recognized it. Barfly is one of those movies that features a ton of old LA locations, mostly bars and hotels. The bar where most of the action takes place in the movie is a fictional dive called The Golden Horn. I’ve always wondered exactly where this location was, as the building was torn down immediately after filming the movie, and, as mentioned above, the layout of the streets has been altered. But due to the screenshots above, I now know exactly where the building was! I’ve actually been in about half of the bars they show, I used to have a thing for dive bars – part of my fondness for old architecture. A lot of the bars shown in the credits are now gone. I have not yet gotten the Sennett book, unfortunately. My brother had a heart attack shortly after the last time you and I corresponded, and I kind of forgot about everything else in the meantime (he’s fine, it turned out to be a “minor” heart attack). But I will get the book soon! Thanks for the nice words about the article, Scott. The bar on the corner of the Adams Hotel was indeed used as “The Golden Horn” in BARFLY. 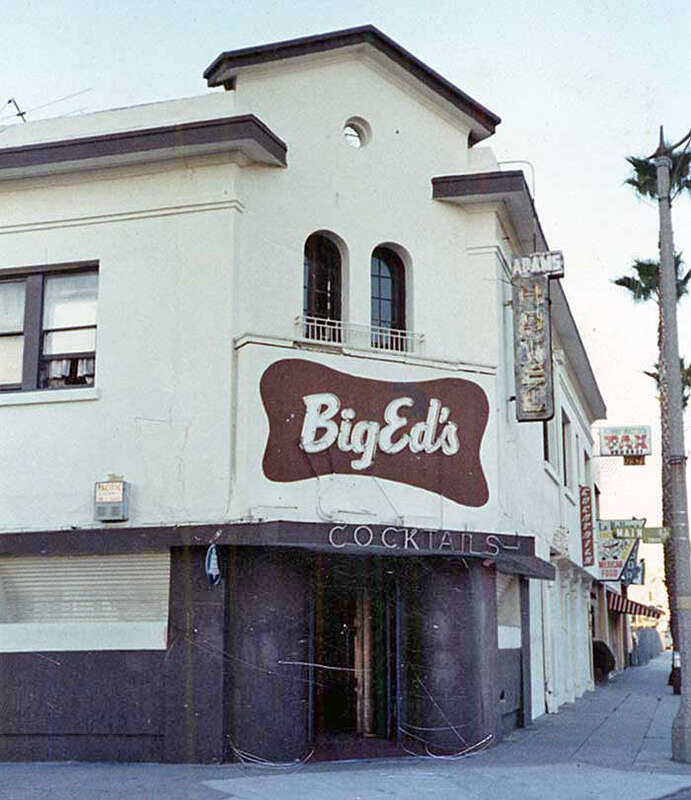 It was called “Sarnas” in the mid-1970’s and became “Big Ed’s” in the 1980’s. Sorry about that, Jim, I somehow misread something, making me think that the lordheath.com website belonged to you. Thanks for forwarding the information! I love these comparison pics. Well done! Wonderful photos and history! I really enjoy these posts!